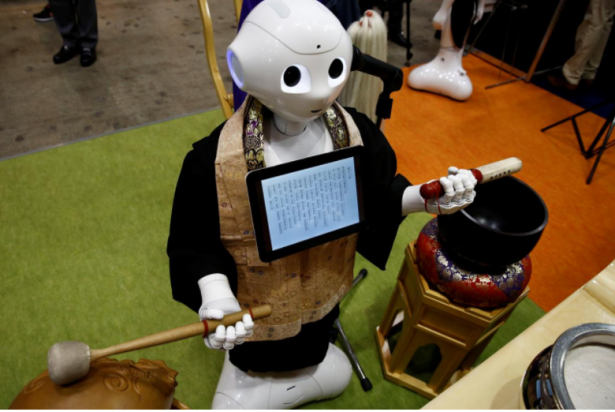 A Japanese company has introduced a new role for SoftBank's humanoid robot "Pepper" - a Buddhist priest for hire at funerals. Chanting sutras in a computerized voice while tapping a drum, the robot was on display on Wednesday at a funeral industry fair - the Life Ending Industry Expo - in Tokyo. Nissei Eco Co., an unlisted plastic molding maker, wrote the chanting software for "Pepper", which was introduced by SoftBank Group Corp. in 2014. With Japan's population ageing and shrinking, many Buddhist priests receive less financial support from their communities, prompting some to find part-time work outside their temple duties, said Michio Inamura, Nissei's executive adviser. Buddhist priest Tetsugi Matsuo said he came to the expo to see if Pepper could "impart the 'heart' aspect to a machine because I believe that the 'heart' is the foundation of religion." The robot has not yet been hired for a funeral.